It’s been exactly 195 years since this brand started existing on the market and the very first time piece came out. One of the worlds best art crafting watch manufacturer is celebrating his anniversary of existence on the market, the story started long time a go and since than has never stopped. The complications invented, composed and introduced by this brand has left a real hallmark in the time and in watch making in general. This year they are celebrating the their long existence with a complication which is a follower of the Fleurier Grandes Complication Collection, line that is about to prolong the traditional, art crafted manufacturing, taking thing to another higher level. The Virtuoso VIII is here to continue what has been started, and to introduce and represent Bovet as a pioneer in watch making. The constant maintenance of the bare up high is what makes Bovet the what it is, a symbol of perseverance and quality, for that reason the Virtuoso VIII represents the essence of the Fleurier Grandes Complications collection as defined by Pascal Raffy himself. Virtuoso VIII has a few features cared from the previous wrist watches introduced recently, definitely this is the firs Bovet time piece to reprise an inclined crystal aperture along the 12 o’clock to 6 o’clock axis , as well as the magnificent case of the Recital 18 Shooting Star. 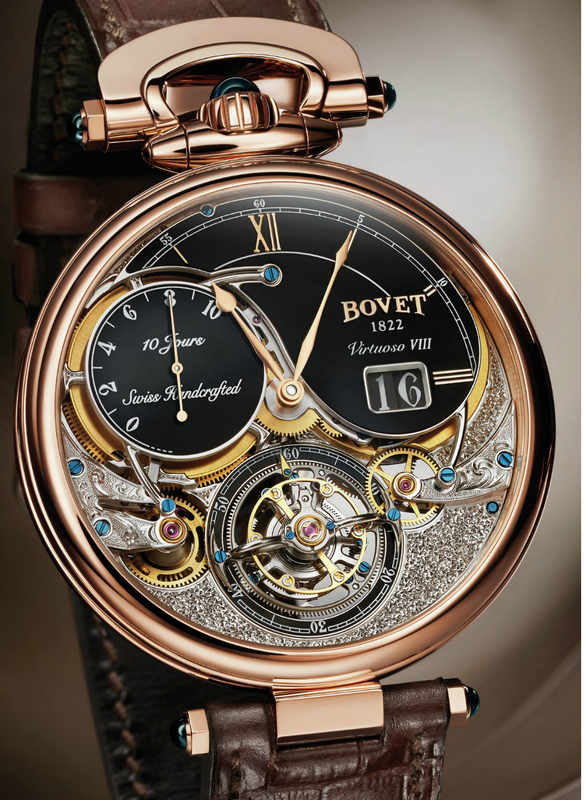 When it comes to the movement there are certain characteristics presented in 2015, but over all t as it’s said on Bovers page “Virtuoso VIII is a the ultimate expression of the artisanal watchmaking tradition that is been upheld by Bovet since 1822. If we decide to talk about the movement of this watch and the whole set of this calibre there is so much to be said and discover. This double tourbillon movement works with incredible punctuality, the main balance is provided with the help of the tourbillon set in the centre of its axis and the balance spring reducing the friction at the pivot point. The pace of the caliber is set with especially created variable inside balance wheel, which provides better stability and improves the quality and continuance of the movement. So far to this time piece has a few more mechanisms incorporeted in to his body to boost the long life of the caliber and his working. The highly controlled oscillation of this watch are producing 18,000 vph, providing 10 day of a power reserve. The overall movement architecture is based on 19th century watches, with a full plate and bridges hollowed out in to a series of scrolls. Bovet has always stick to the artistic expression of the time, the historical growth of this pioneer in watch making has left an obvious imprint over Virtuoso VIII, both nicely shaped sides of the plate immediately remind of Bovet’s historical pocket watch. The two sides of the plate are engraved with pattern which requires special technic of engraving to turn in to a shiny, blink and fine surface that perfectly goes with the polished bars and bridges braided in to a Bovet symphony. The dial-makers have showcased the decoration of the movement to perfection by creating two harmoniously arranged dials. The first indicates the power reserve while the second displays the hours, the minutes, and the magnificent big date aperture. In order to conceal only those mechanisms that would otherwise interfere with the timepiece’s legibility, the surface area of the dials has been reduced to a minimum while sumptuous, rounded-off and hand-polished attachments straddle the bridges before anchoring themselves solidly to the movement. Whether the dials feature lavish ivory or black lacquer or precious blue aventurine, the Arabic numerals and their graduations, as well as the shape of their hands, have been directly inspired by the historic pocket watches from the BOVET 1822 collections. Designing a master piece like this was a real manufacturing challenge, obviously the talented watch makers has pushed there energy to max to develop a wrist machine with such a sensational, quality, accuracy and design. 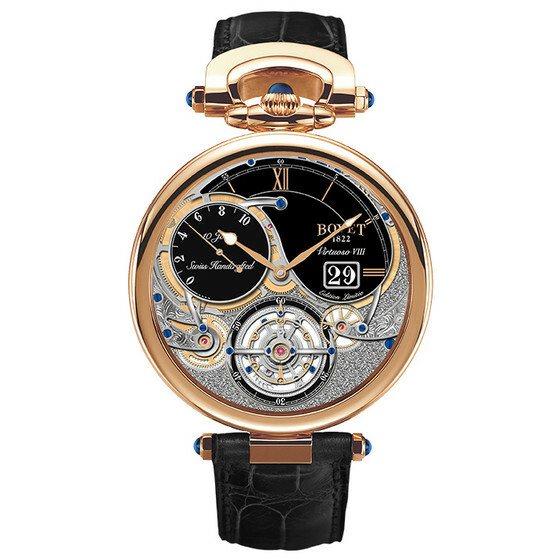 The constant upgrade and develop on the existing concept and idea has always paid of, and Bovet has again shown why is taking a place in the top names in the watch industry.